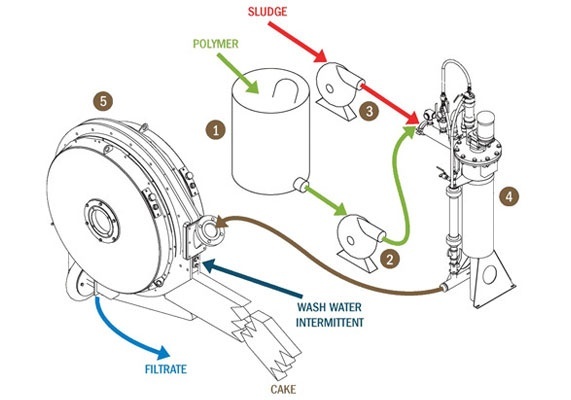 The ROTARY PRESS is at the heart of the dewatering process, completed by sludge and polymer feed systems. The principle of operation is simple. Sludge is fed at low pressure into the channel and rotates between two parallel revolving stainless steel chrome plated filtering elements. As free water passes through the screens, the sludge continues to dewater as it travels around the channel. 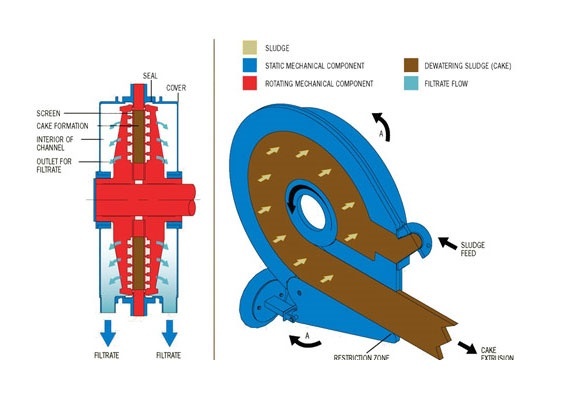 The flocculated sludge builds up solids until enough pressure is generated against the outlet restricted arm. The frictional force of the slow-moving filtering elements, coupled with controlled outlet restriction, generates enough back pressure to dewater the remaining solids, resulting in the extrusion of a very dry cake.